Caribbean people, in the humble view of our newspaper, all too frequently take too many unnecessary risks with their lives. They do so, while often jestingly boasting that nothing untoward will happen to them because God is Grenadian, Trinidadian, or of some other West Indian nationality. But recent events have suggested that more prudence ought to be exercised in the way we negotiate with our environment. The events include one in Grenada, another in St Lucia and a third in St Vincent. The worst of the three, certainly, was the mishap in St Vincent a week-and-a-half ago. 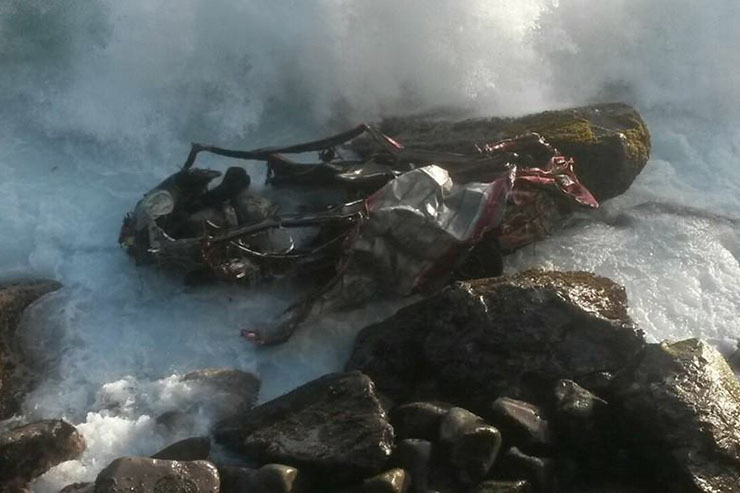 A minibus carrying more than 20 Vincentians, including 14 children, plunged into the sea. Eight people died. Two days later in St Lucia, four people — including two young brothers — were killed when a truck in which they were travelling struck a utility pole, overturned and burst into flames. The four were trapped in the burning wreckage. In Grenada, only good luck and a metal railing prevented a minibus, which had lost one of its wheels, from careening over an embankment, on Upper Lucas Street, and possibly killing the driver and all his passengers. Underlying the Grenada, St Lucia and St Vincent incidents is the urgent need both for an examination of the region’s road traffic ordinances, and also for motorists to practise more caution as they navigate the road. The streets of the Caribbean were never designed for the volume of traffic we now are experiencing; or, for the speed at which people drive. For the most part, roads were constructed for donkey carts and horse-drawn buggies; wide enough and amenable enough to take our former colonial rulers to their important destinations, such as to the seaport to ship their sugarcane and other raw materials to Europe. With population growth, we have houses now perched precariously next to bustling thoroughfares; and many roads are not far removed from what they were in the buggy and cart days. Still, Grenadians and other Caribbean motorists often claim that because of their ability to drive on our numerous narrow, winding roads — sometimes at breakneck speed – they are the best drivers in the world. However, Caribupdate Weekly believes the time has come for a reality check. Life is too precious to be attempting all this unnecessary risk-taking, especially when the person at the wheel is operating transit that is commuting members of the public. We are not here commenting on the specifics of what may or may not have caused the accidents in St Vincent, St Lucia and on Lucas Street in St George’s. But, what we are arguing is that there are general points that need to be examined to make traffic safer, and to protect lives against vehicular deaths and injuries. Of course, many roads need paving or resurfacing. Vehicle inspection, too, can be stepped up to ensure that those vehicles — especially buses — that are allowed on our roads are truly worthy of being there. As well, more resources could be applied, including modern technology and deploying more traffic officers on the streets, to catch speedsters. Additionally, we can learn and adopt from other countries that have done research and have implemented measures to try and make the use of the road as safe as is possible for drivers, passengers and pedestrians. For example, many countries penalize drivers who are caught texting or making or receiving calls while driving. The research has shown that many accidents are caused by distracted drivers using hand-held devices such as cellphones. There also are examples also of measures put in place to avoid distraction to drivers who operate public transit. In developed countries like Canada and the United States, there are notices posted in buses, telling passengers to stand a certain distance from the driver and to avoid engaging the driver in conversation while the bus is rolling. Even in Jamaica, the country’s Urban Transit Company announced recently that it was getting more diligent in cracking down on passengers who eat, drink and smoke on their buses; and those involved in noise-making. Most people forced to use minibuses in Grenada will agree that similar policies are perhaps needed here. Too many times, one gets on a bus in Grenada and regrets doing so. Not uncommonly, to begin with, the operator tries to pack more passengers in the bus than it is licensed to carry. They use foam to construct a couple of extra makeshift seats. Passengers then sit angrily, sucking their teeth at the cramped conditions inside the bus; they sulk, too, at the speed at which the bus is being driven, the volume of the music coming from the in-house speakers, or at a loud and boisterous conversation to the front, side or back of them. Not only is all this commotion annoying to many commuters, but it also leaves us wondering about the distraction on drivers. We ought to do better. Not only should tourism be everybody’s business. Road safety also should be.